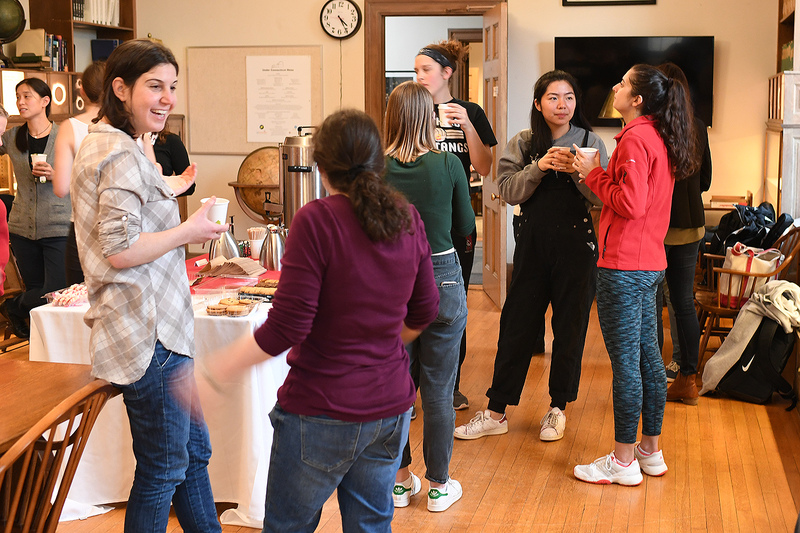 On Feb. 15, the Wesleyan Women in Science (WesWIS) group hosted a student-faculty tea for WesWIS students and female science faculty. The event took place inside the Van Vleck Observatory’s library. Women in Science is a student group composed of undergraduates, graduate students, postdocs, staff and faculty dedicated to issues affecting women in science. The group is open to all majors and genders. 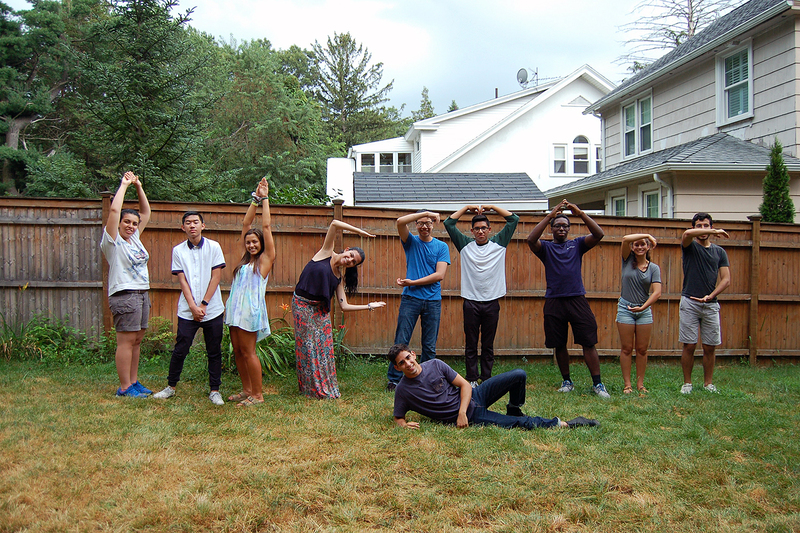 Ten Wesleyan Mathematics and Science Scholars participated in a weeklong program on campus this summer. The Wesleyan Mathematics and Science Scholars (WesMaSS) Program is a highly selective academic program designed to support students from traditionally underrepresented groups who are interested in pursuing study in mathematics and natural sciences. The program aims to foster community building and provides the scholars, who are all incoming first-year students, with mentoring and academic resources which encourage and facilitate their sustained involvement in these fields. Each scholar also receives a Wesleyan faculty mentor. 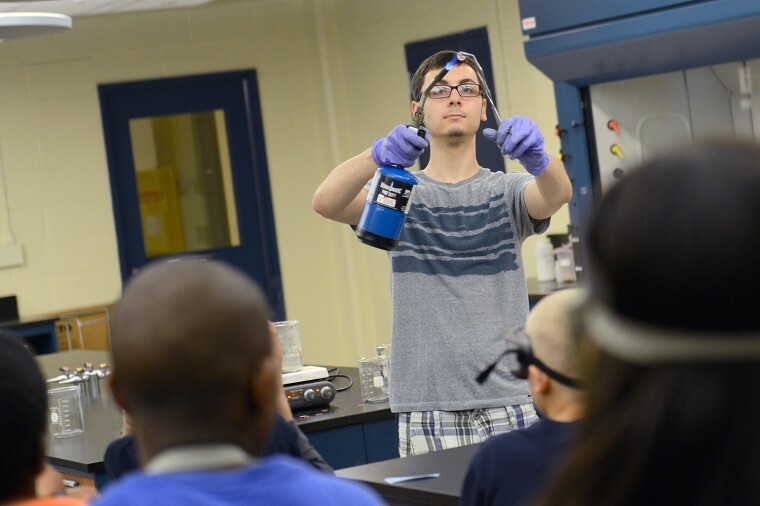 From July 26-31, 10 of the 32 WesMaSS scholars participated in an intensive introduction to studying science at Wesleyan. 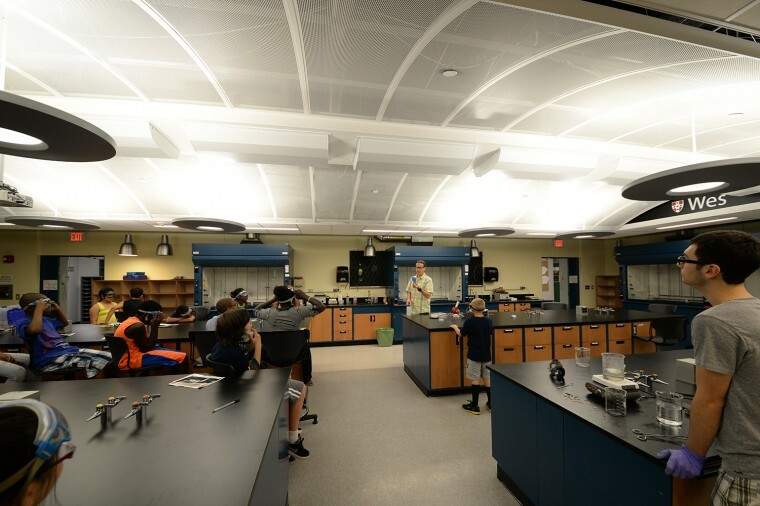 Students toured the science departments, became familiar with the range of resources available, and attended workshops focused on the expectations for academic work at Wesleyan. They also met with T. David Westmoreland, associate professor of chemistry, who is serving as director of the WesMaSS Program. 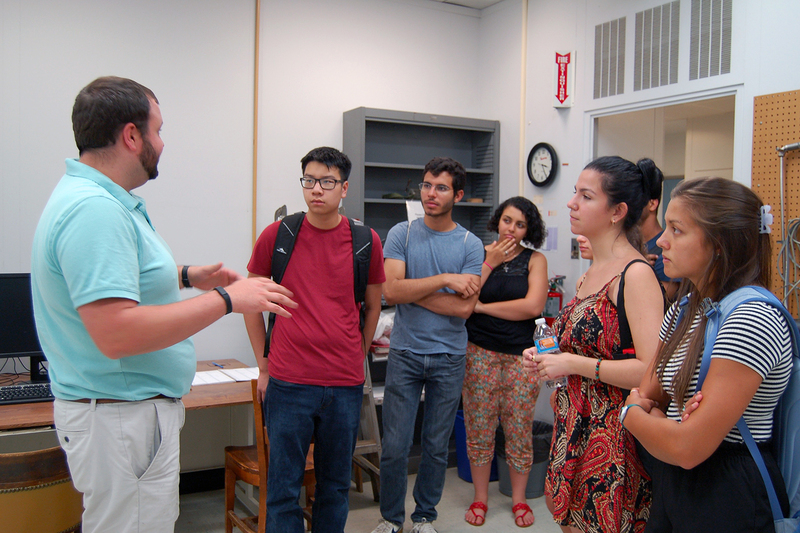 Students attended a mini-course in network analysis offered by Pavel Oleinikov, associate director of the Quantitative Analysis Center; a microscopy lab introduction by Jeff Gilarde, director of scientific imaging; and a tour of the Joe Webb Peoples Mineral Museum by James Gutmann, the Smith Curator of Mineralogy and Petrology. The students also participated in many social activities. The program culminated with the Undergraduate Research in the Sciences Symposium, a day-long event that featured a keynote lecture by a prominent scientist and a poster session of the undergraduate scientific research projects. 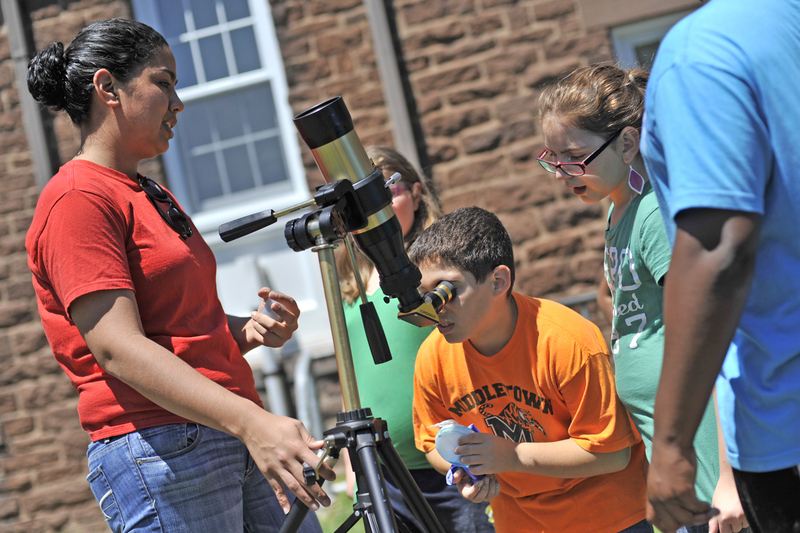 Fifth graders from Snow Elementary School in Middletown toured Wesleyan’s astronomy, biology, chemistry, physics and scientific imaging departments on June 18, 2014. Students also visited the Joe Webb Peoples Museum and Collections in Exley Science Center. Brian Northrop, assistant professor of chemistry, used the reversible hydration and dehydration of cobalt(II) chloride to demonstrate Le Chatelier’s principle and create color-changing “humidity sensors.” Pieces of filter paper were saturated with a solution of cobalt(II) in water, which turned the paper pink. Warming the paper with a blow dryer evaporated the water and turned the paper blue by re-forming cobalt(II) chloride. 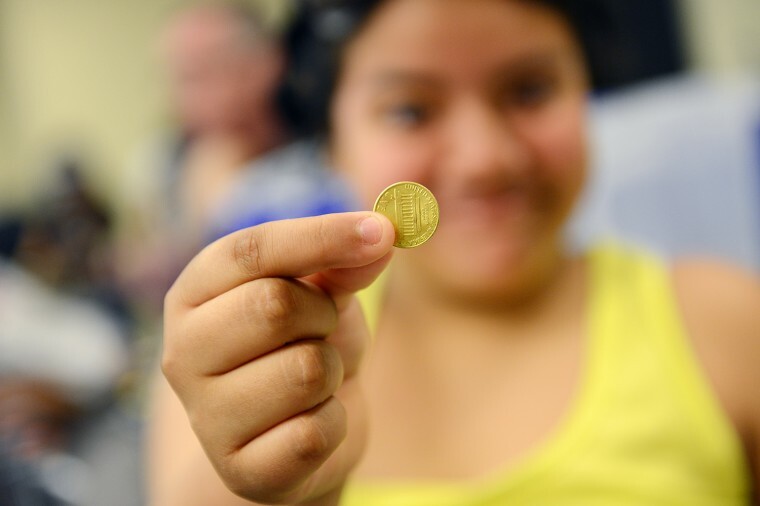 Research student Jesse Mangiardi ’15 Mangiardi ’15 demonstrated how to change the chemical composition — and color — of a penny. First he submerged a copper penny in a solution containing zinc mixed with a base, which coated the penny in zinc and made it appear silver. Next, he heated the zinc-coated penny with a blow torch which caused the zinc and copper to react and form brass, and turned a penny bright gold. The students took a few silver and gold pennies back with them to Snow School. Ishita Mukerji, dean of the Natural Sciences and Mathematics division, is one of 50 local scientists to be elected to the Connecticut Academy of Science and Engineering. 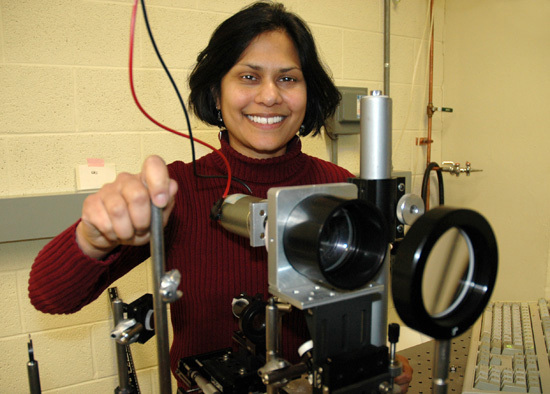 Mukerji also is professor of molecular biology and biochemistry and is an expert on fluorescence and vibrational spectroscopy. Mukerji is the 10th Wesleyan faculty to be elected into the academy. She will be introduced at CASE’s 39th annual meeting and dinner on June 5 at the Crowne Plaza in Cromwell, Conn.
On Nov. 9, Wesleyan’s informal science education class in conjunction with the Wesleyan Science Outreach Club presented Science Saturday, a semi-annual fun afternoon of hands-on science for the whole family. Activities took place inside the Exley Science Center. 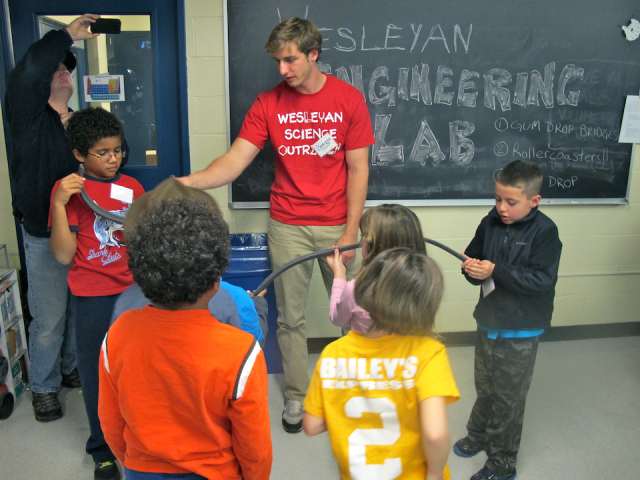 Wesleyan students taught science lessons that they have been working on this semester, with experiments involving dissections of biological specimens, roller coaster models, and an explosions demo. More than 50 local children and their parents attended. Andrea Roberts, visiting assistant professor of chemistry; Manju Hingorani, professor of molecular biology and biochemistry; and students from the CHEM 241 Informal Science Education course coordinated the event. 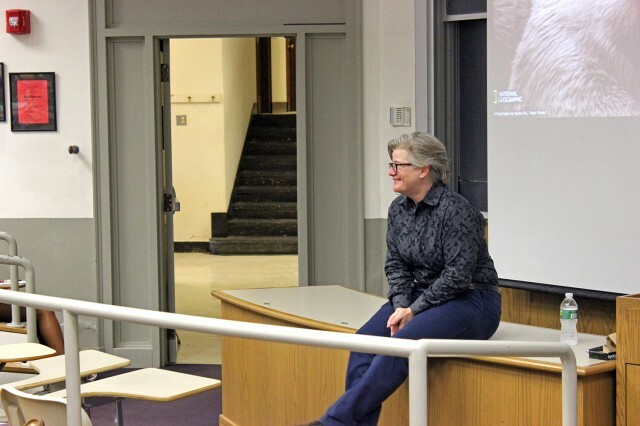 Lee Ligon ’87 returned to campus on June 19 and spoke to students about “Tubulin post-translational modifications: road signs in the cell” during the Hughes Program in the Life Sciences Summer Science Seminars Series. “Innovations: Intersection of Art and Science” is co-hosted by the Center for the Arts and the Hughes Program in the Life Sciences and curated by choreographer Liz Lerman. Starting on Feb. 28, Wesleyan will bring together teams of artists and scientists to share approaches, skills and outcomes of their research at the intersection of art and science. The symposium, titled “Innovations: Intersection of Art and Science,” is part of the Creative Campus Initiative at the Center for the Arts. “The goal of this experimental program is to elevate the arts as a means of teaching, learning and knowing through co-teaching opportunities for artists and non-artists, as well as commissioning new works by artists who are invited to work with faculty and students across disciplines in their creation process,” said Pamela Tatge, director of the Center for the Arts. “Innovations: Intersection of Art and Science” is co-hosted by the Center for the Arts and the Hughes Program in the Life Sciences and curated by choreographer, performer, writer, educator and speaker Liz Lerman. Lerman is the founding artist director of the Liz Lerman Dance Exchange. Speakers include Katja Kolcio, associate professor of dance, associate professor of environmental studies at Wesleyan; Leila Kinney, executive director of the Arts Initiatives at the Massachusetts Institute of Technology; Marda Kirn, founding director of EcoArts Connections; and Richard Prum, professor of ornithology and director of the Franke Program in Science and the Humanities at Yale University. Fifth grade students from Snow Elementary School in Middletown toured Wesleyan science departments on June 15. 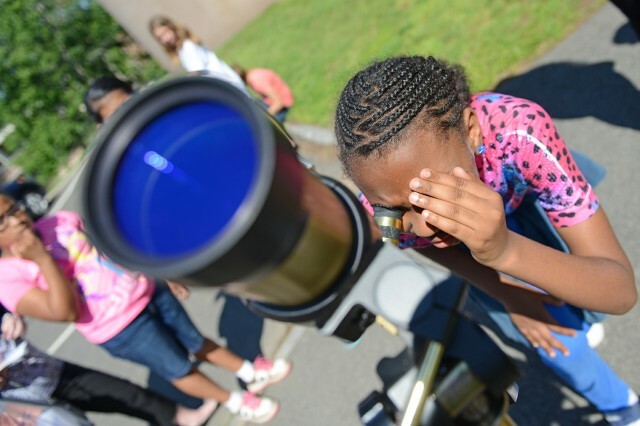 Pictured, a Snow School student observes sunspots and solar flares through a telescope at Wesleyan's Astronomy Department. 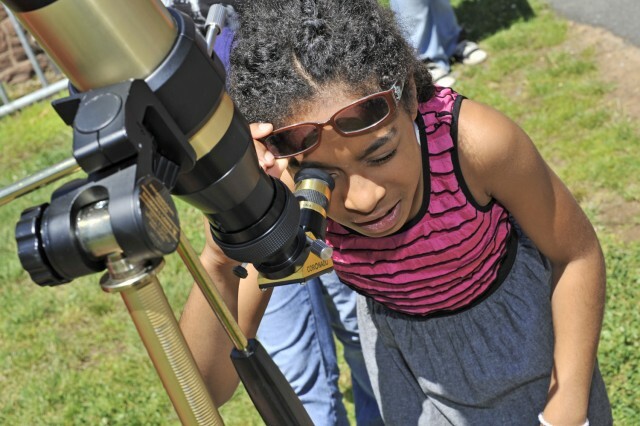 Astronomy graduate student Raquel Martinez explains how the telescope uses a hydrogen alpha filter, which allows light of exactly one wavelength to pass through, not harming the eye. 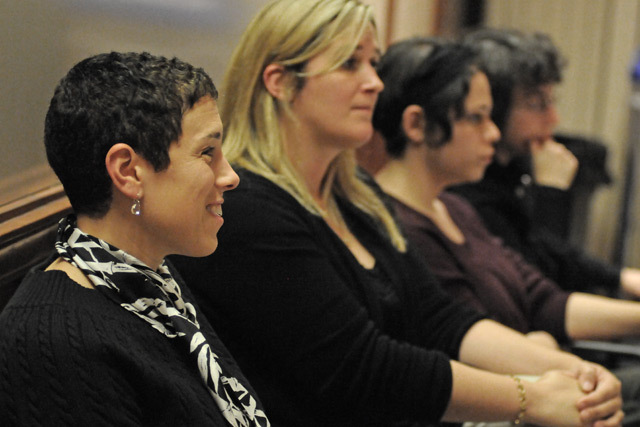 Wesleyan's Women in Science (WIS) group hosted a Women in Science Career Panel Nov. 10 in Woodhead Lounge. Panelists included women with careers in industry, academia and medicine. WIS is a student group composed of undergraduates, post-docs, staff and faculty dedicated to issues affecting women in science. 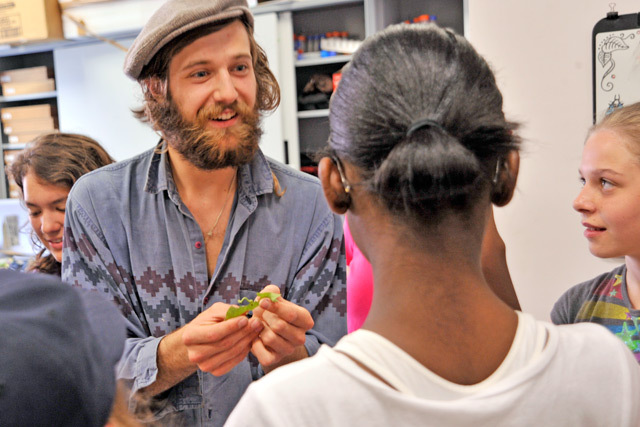 Researcher Isaac Lichter-Marck taught the Snow Elementary School students about caterpillars in the Biology Department.